We went down to the Cape today for the Thanksgiving Holiday. Eva had a half day of school and a Thanksgiving Feast there. She had a really nice time despite some really nasty rain today. Everywhere we went the storm drains were clogged and the water was filling the streets. The rain continued to pelt down all day until well into the evening. It must have scared people away from the Cape because we had a pretty nice ride down. We enjoyed a nice family meal with Mom and Dad, Tara, Shelby, Cousin Dylan and Grandpa Rick. A pre-Thanksgiving pizza meal. We did have some Traditional Thanksgiving faire though with green bean casserole while we did the Onion Crunch Challenge. Onion Crunch didn’t win but it did make for a great pizza topping. 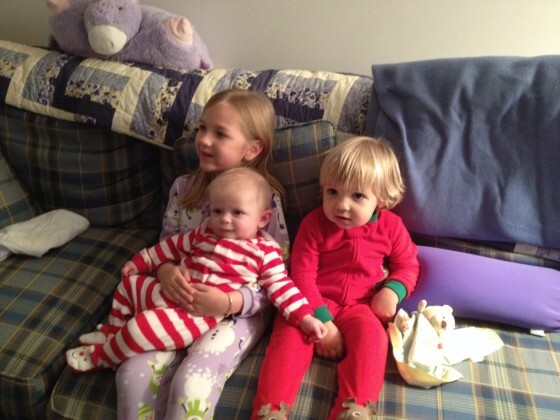 After dinner the kids got into their PJs and we got a few pictures of the cousins together. They are ready for Christmas.